I’ve been traveling constantly ever since 1984. Since then, I’ve discovered and uncovered all kinds of tips and tricks for a better trip. My TravelPro suitcase is always filled with various discoveries, which make my trip better, more comfortable, and just a little bit more luxurious. After all, don’t you want to look and feel your best on your trip? Here’s how you can also “carry on” beautifully. Clarisonic Mia 2. When you are jet-lagged, you look it. Or better said, it shows up on your face. How to eliminate that puffy, tired, strained appearance? By cleansing your face with a travel-size Clarisonic Mia 2, which uses sonic technology to buff your face to beautifulness. Not only will your skin become squeaky clean, it will be better primed to absorb potions and lotions, for radiant results. You will be ready for your close-up! ROC Daily Resurfacing Disks. What a pad! Each contains skin-conditioning cleansers, and is self-foaming, to gently exfoliate away facial dirt and oil. This new product has been clinically shown to diminish the appearance of fine lines and wrinkles, and is also a lifesaver when your skin is sagging and jet lagged. I’m also loving my daily routine with ROC 4-Zone Daily Moisturizer that has an SPF of 30; not only can you wear it every day, but it’s great at 35,000 feet when the sun shines in through your airline window. And at night, make sure to use the Retinol Correxion eye cream, plus the Night Treatment, so your skin wakes up wonderfully refreshed – and pumped up for sightseeing. ROC skincare contains pure retinol, to firm your skin by improving elasticity, and reducing the appearance of fine lines and wrinkles. Remember, retinol is the “gold standard” in anti-aging ingredients, and ROC, established in France by a pharmacist and dermatologists, is a leading French skincare brand since 1957. ROC rocks! Living Proof. Now you know why Jennifer Aniston’s hair always looks so good. She not only has her own personal hairdresser, she is part owner of Living Proof in Cambridge, Mass. Living Proof is essentially the science of beautiful hair. Scientists there literally broke the mold when they made two discoveries. The first is OFPMA, a bulletproof molecule that creates an invisible shield around each hair strand. Over time, hair fights off humidity, repels oil and dirt, and achieves a glossy luster. Second, they discovered PBAE – a tiny molecule that creates a pattern of thickening dots on each strand, making it behave like textured, full hair. You wind up with va-va-va-voom volume. What I love are the Travel Sizes of various lines, such as the Restore line. I used the special shampoo, conditioner, and targeted repair cream, and the results are astonishing. My hair is not only chemically straightened with Keratin, but it is highlighted blonde. When I blow it dry, I don’t just dry it – I beat it into submission. So you can imagine the rough treatment it gets. But with Living Proof, my tresses turned into spun silk – shiny, sleek, and chic. Alive! Women’s Gummy Vitamins. Yum’s the word! I love a daily gummy vitamin, because it feels like a decadent treat, but it’s simply a smart addition to my diet. Alive is made with pectin and sweetened with organic tapioca; three gummies have just 25 calories and are gluten-free, containing no yeast, wheat, gluten, dairy, eggs, peanuts, artificial sweeteners or preservatives. Stash these in your suitcase, especially when you’re on the road and may not be getting all the right nutrition. They contain 25 fruits and vegetables too — after all, why should kids have all the fun? Jane Iredale BB Cream. Everyone’s heard of BB cream by now, and I personally love the Jane Iredale Glow Time BB cream that makes your skin like luminous velvet. Jane Iredale, as many of you already know, is the Number One makeup choice of skincare professionals, and is “the skincare makeup.” Glow Time contains natural minerals that adjust to your skin, to smooth and brighten your complexion. Even better, this formulation is water-resistant to 40 minutes and has a 25 SPF. It contains a cornucopia of goodies including grapefruit extract, sunflower seed oil and aloe leaf juice. What’s not to love? And if you love chocolate – what woman doesn’t? – add Chocoholicks to your beauty case. The slim copper compact contains four hydrating lip glosses that smell just as good as they look. There’s blood orange, espresso, very berry and chili pepper. 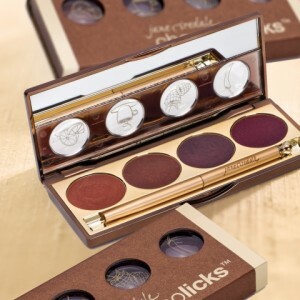 When first launched, Chocoholicks was wildly successful, and is designed to take your lips, lusciously, from day to night. All-natural flavoring, and fruit extracts are used for taste and aromatherapeutic benefits. Well, the time is ripe to enjoy them – especially when you’re on the go. It’s one of life’s little luxuries to enjoy! MIO. Mamma mia, I love MIO. When you’re traveling, if you’re like me, you want to watch your calories and avoid drinking high-calorie beverages. That can be hard when you’re dining out in Dubai, or seeking a diet drink in Devonshire. That’s I like to take MIO in my handbag. You can order plain, ordinary, simple water, and instantly transform it into something deliciously decadent. This award-winning, wonderful water enhancer comes in 11 flavors and has zero calories per serving. I’m so grateful that the folks at Kraft Foods sent me samples!